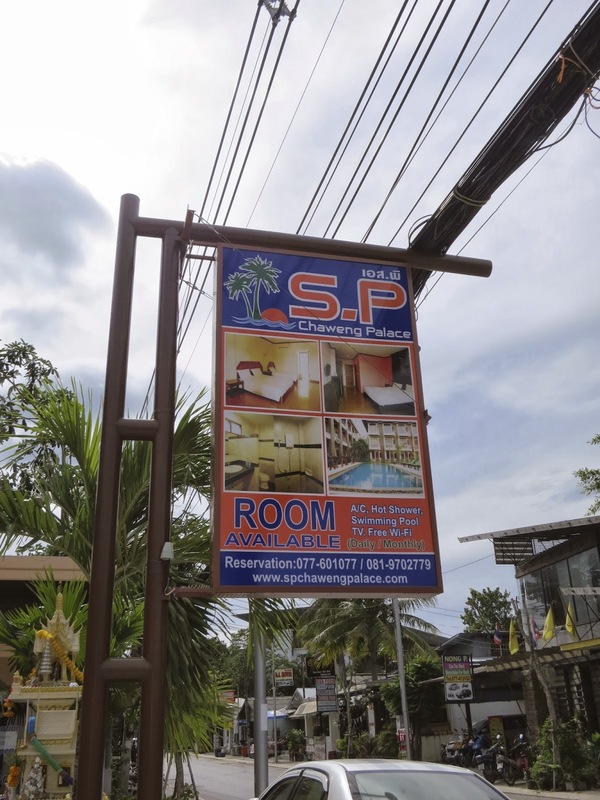 The first thing we did upon arriving in Koh Samui was to find a lodging. For this trip, we did not make any reservation for any accommodations. The night before we leave for another town, we simply check online if there is accommodation in that area. We decided to stay 3 nights at Chaweng area and checked out around 4 hotels. The lodging near the beaches were either full or beyond our budget. This one was a street away from the beach, was new, with a pool and very reasonably priced. Parking located just before the reception area and there was a guard on duty at night. Comtemplating on buying this and ride it back to Singapore. One of the thing I wanted to do with my super long hair is to braid it. As we were walking along Chaweng Street, I asked a few shops for quotation and settled for one that was willing to braid my hair for 1000baht. No more frustrating hair tangles from riding! 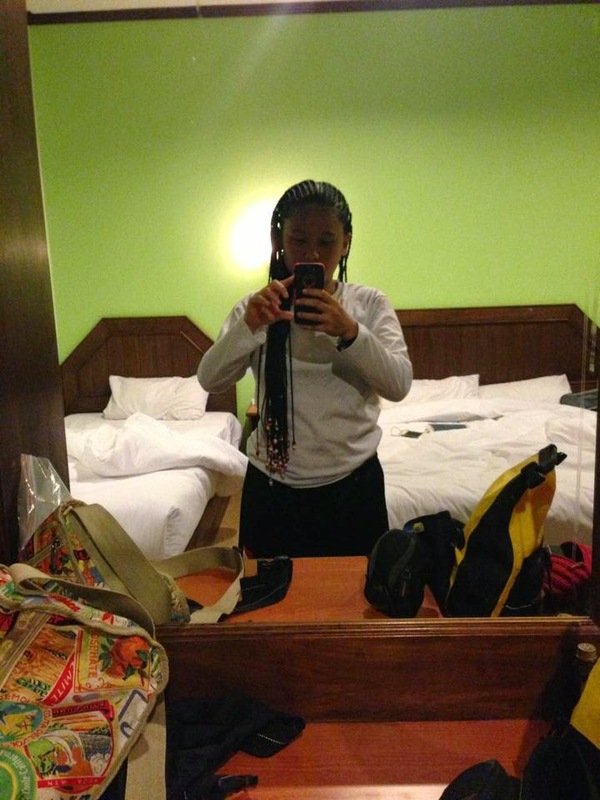 Spent 2 hours and 1000baht to get my never-cut-for-4-years hair braided. Riding on top of a 4X4 to the waterfall. The next day, we went to explore the island. 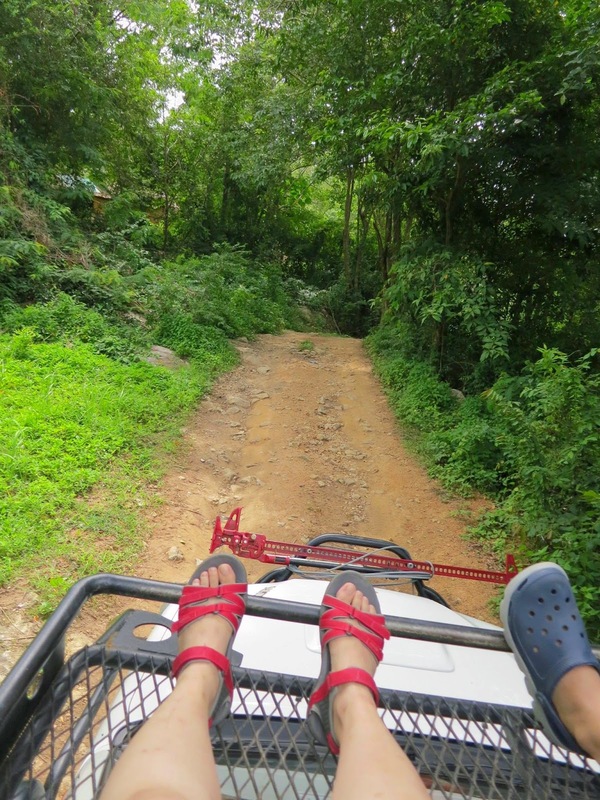 We took a 4X4 to Namuang Waterfall. On our way out of Namuang Waterfall, we took the wrong route and ended up at this animal shelter. It is ok to get lost at times. If we did not get lost, we would not have ended up here. We just walked into the place and was free to explore the place on our own. Near the gate was a leaflet introducing the shelter and the map. Very soon after we entered, a volunteer approached me and offered to bring me around. That poor bandaged up fellow was dragging himself. These dogs are adopted and waiting to fly off to the prospective owners from different part of the world. This gentlemen just adopted this puppy. 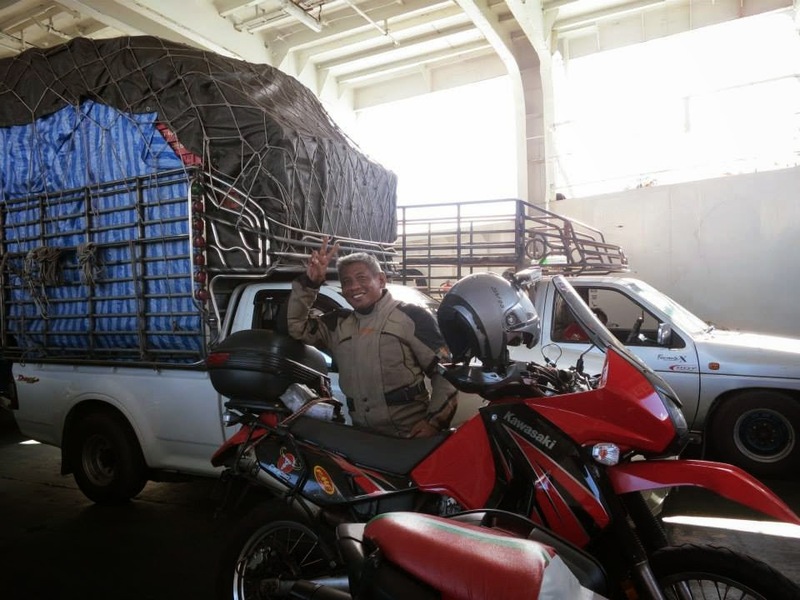 To educate the people of Koh Samui concerning the keeping of their animals. Previously, the dog population in Koh Samui was controlled by mass poisoning. If that makes you sick, do support their sterilisation programme, a more humane method. I used to work as a Vet Nurse, and whenever I mention castration, the guys will go wooo ahhh ouch. When I brought my dog home after his surgery, I remember my brother looking at my dog with a little bit of sorrow over its "loss of manhood." Would you rather the dogs "lose their manhood" or slowly writhe in pain to death? Dogs, they do not know contraceptive. So, if we do not wish the place to be overpopulated with dogs, more than what the community can manage, we have to stop them from breeding. All these operations requires money. We made our little contributions to the shelter. If you have pets yourself and love them to bits, you should understand how heart wrenching it is to see animals abandoned, abused or injured. If you would like to make a contribution, you can do so via Paypal link below. Next, we went around the island to look for a Vespa shop. We stopped by a few bike shops along the main road to ask if there is one around. Then a gentleman came over and told us to follow him. Ok, we were led into one of the small road and ended up at this shop. We would not have found this shop by ourselves. A few vespas and other classic bikes outside the shop. The shop owner's children, Paem and her younger brother, took a polaroid photos of them together. They immediately placed it in their mother's wallet. This girl showed me how to kickstart the scooter. Her dad said this will be hers one day. I pointed out that photo to the mechanic and ask if that is his father. "No, he is our king. This is a very nice photo." The King of Thailand with his Vespa scooter. The famous temple where the undecomposed body of a monk rest. We noticed a small run down sign with the word, Z….. waterfall. It was not on our map, we just went in and rode some off roads. We spotted a sign that stated "waterfall" and followed it. Ended up here and the road was getting too tough and we did not go any further. We came to this waterfall instead. Then we went to the Big Buddha. 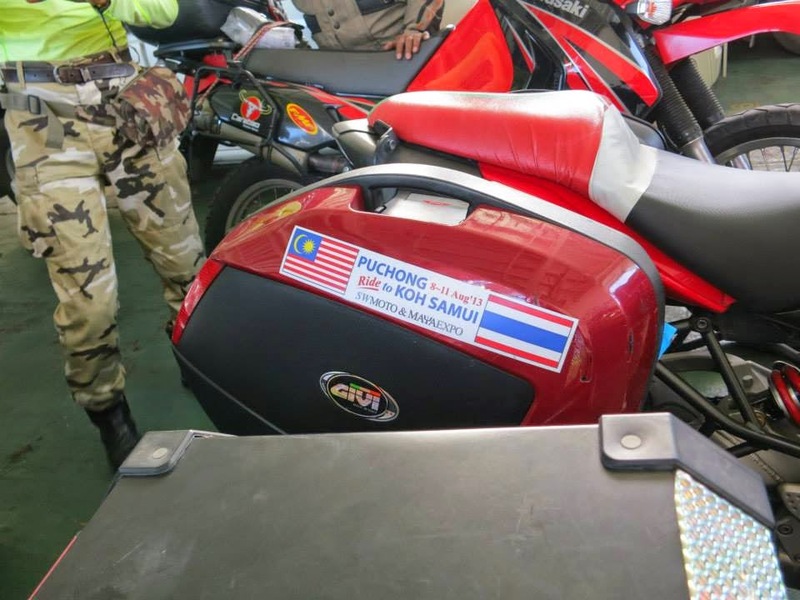 This Vespa is from Penang. 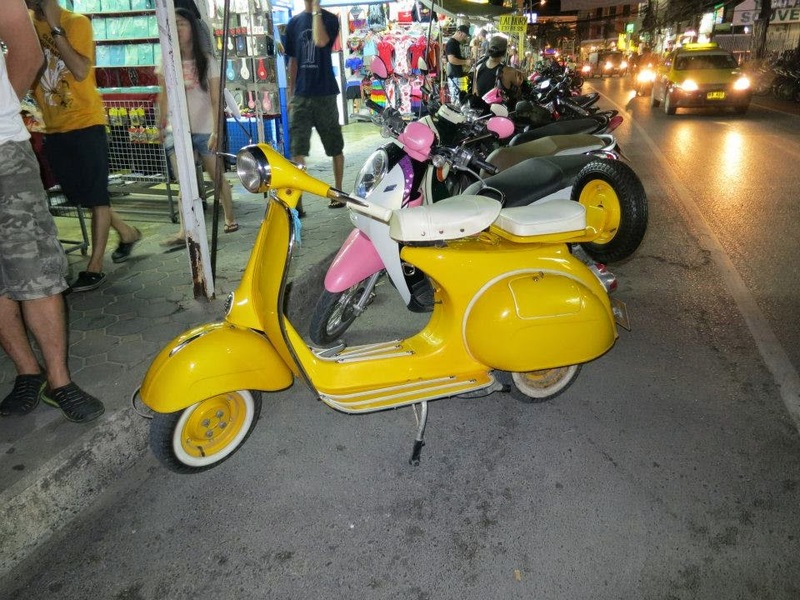 In the evenings, I explored Koh Samui on my own after dinner with Ah Weng and Sharon. While riding back to our hotel previously, a big beautiful painting of elephant caught my attention. I decided to walk to the art gallery which took me one hour. I was greeted by Chai the painter, who stopped his painting halfway to tend to me. He showed me all his work and talked a little bit about them. Meditation is when he get most of his inspirations for his work. He was also an avid biker, he rides a Harley. I really love the elephant painting I saw and want to bring those home. Thankfully, he has smaller versions of those. So I bought two paintings. If you have a longer stay in Koh Samui, Chai could customise the painting for you, if you would like a message or a name on it. It takes around 3 days for the painting to dry. Aren't they pretty? These paintings survived another two weeks in my top box. On the last evening in Koh Samui, I went to explore the place on my own again. I rode past a lake and noticed a row of fanciful cars lined up and iluminating to the beats of dance music. People lay their picnic mats and enjoying banter over bottles of beer while some grooved to the blasting music. I spotted this really wicked car. I wonder if it can fly. At the ferry pier of Koh Samui to return to mainland, while queuing up for the ferry, we were surround by a group of Malaysian tourist, aunties and uncles. Curiosity about our Vespas drew them to us and they began bombarding us with questions. The group of Malaysian Tourist at the Shelter later approached us. "Did you ride all the way here?" "How long did you take to come here?" They were very amused to see little scooters coming such a long way. "Wah, Vespa also can ride so far. My uncle used to have one. Maybe next time I can do it too. Hahaha." 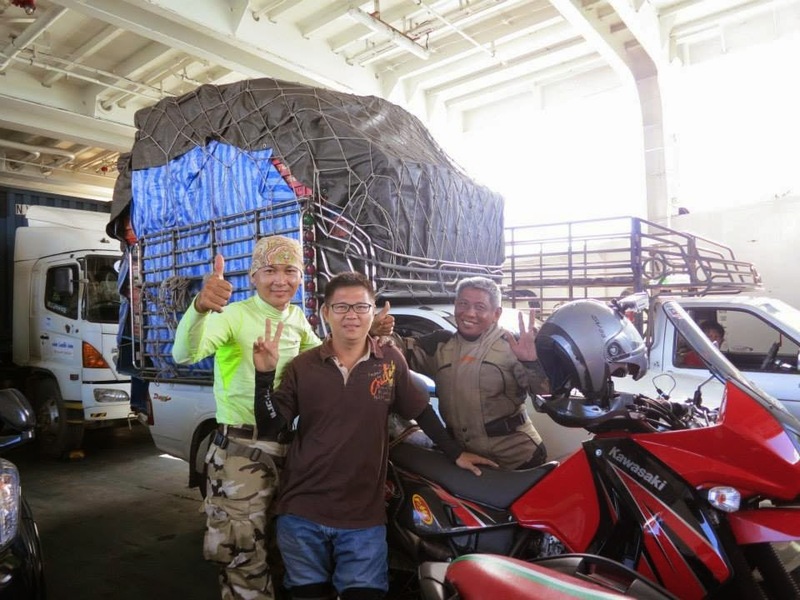 On the ferry, we met another group of Malaysian bikers from KL. The gentleman in green is Jackie. He gave us his contact and told us to contact him if we need any help in KL. If you like this post, I hope you can show your appreciation by making a small donation to Dog and Cat Rescue Samui Foundation. To find out more about the foundation, click here.